Geek Grotto - Get Your Geek On! 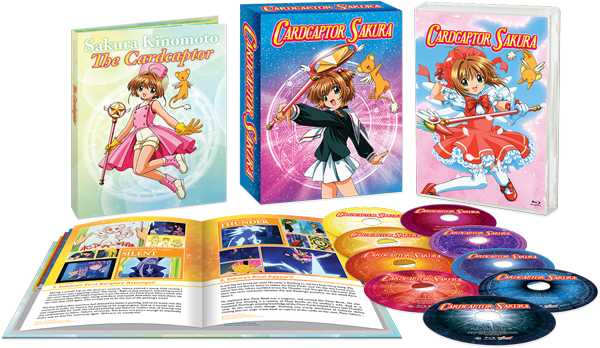 : NIS America Announces CardCaptor Sakura Complete On Blu-Ray! NIS America Announces CardCaptor Sakura Complete On Blu-Ray! NIS just announced that the popular Cardcaptor Sakura will release the August 5th in a Blu-Ray box set!!! CARDCAPTOR SAKURA TO BE RELEASED IN BOTH PREMIUM AND STANDARD EDITION FORMATS THIS AUGUST! Santa Ana, CA (April 30, 2014) – NIS America is excited to announce that the highly praised hit anime CARDCAPTOR SAKURA Complete Series will be released on August 5 across North America in Premium and Standard Edition versions. All versions will be available simultaneously at online retailers, and will offer a bonus English dub. The Premium Edition version will include 70 episodes on a 9 metallic gloss Blu-ray disc set, with a fully illustrated 76-page hardcover art book packed with new content/illustrations and a collectible slipcase. what she finds most important in life. -Hardcover art book (full color, approx. 76 pages) with Tomoyo's diary of Sakura's adventure and full color character illustrations.